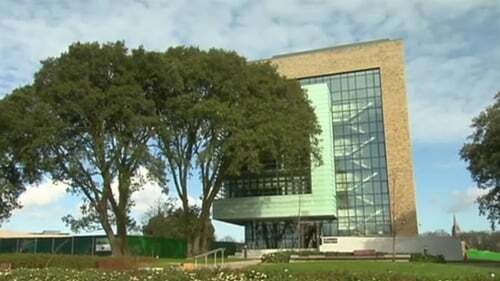 The first new building to be constructed on the Dublin Institute of Technology Grangegorman campus has been opened. The Greenway Hub will be home to the institution’s postgraduate researchers as well as those commercialising their research and growing spin-out companies. The 5-storey €17 million euro building will host DIT’s Environmental Sustainability and Health Institute (ESHI) with researchers working in areas like vision science, food and water quality, energy, biomonitoring and diagnostics, and health policy development. A number of high potential start-up companies including Kastus, Artomatix and BloomMagic are also operating from the hub. It is also housing entrepreneurs who are developing business ideas as part of the New Frontiers programme, funded by Enterprise Ireland and run by DIT Hothouse. The development has been funded by the fifth cycle of the government’s Programme for Research in Third Level Institutions, Enterprise Ireland and DIT. In total the building has 12 specialised labs, office space for 136 people, as well as seminar, meeting room facilities and commercialisation facilities. It also has high-end instrumentation including mass spectrometry, gas chromatography and ultra high performance liquid chromatography – mass spectrometry. Two more new academic buildings are to be built on the campus later this year and by 2019 10,000 students will be studying on the centralised campus.